Yes, you read that correctly! I had heard about this one-man coffee company in Ann Arbor called RoosRoast but had never actually looked into how to find this coffee. 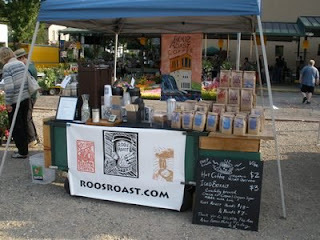 So I was pleasantly surprised to see a booth at the Ann Arbor Farmers' Market this morning where RoosRoast was selling brewed coffee and freshly roasted coffee beans. I stopped to talk and introduce myself to John, and talk we did, about so many things that I never even realized that the name RoosRoast is because Roos is John's last name. I asked which was his best selling variety, and he introduced me to his "meat-free" coffee, which he called "Organic Lobster Butter Love". Oh wow! like picking up a bottle of wine because of the great looking label, I just had to purchase this coffee because of the name. He also hand-wrote on the label "Smell the butter, feel better". I can't wait to smell it and taste it freshly brewed, not just in the bag. I grabbed these photos from John's web site to show you his booth and coffee. 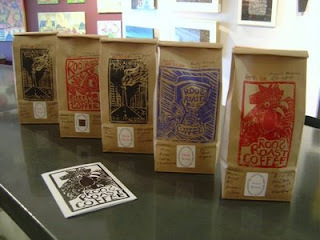 Check out his web site for more info about his coffee, his art, and his love of writing and meeting people. I encourage you to seek out and support your local one-man, one-woman, or small family-owned businesses, too, who are working very hard at their passion and doing their part to enrich the health of your community while keeping both the love and money flowing locally. BTW, one last thing - I often get questions about connections between coffee and increased risk for cancer. Research has looked into this possibility extensively over the years, but to date, even the very large combined data base from 18-24 years of following the people participating in the Nurses Health Study and the Health Care Professionals Study have not shown any increased death from cancers associated with coffee intake (reported Ann Intern Med. 2008 Jun 17;148(12):904-14). So while I still drink 3-4 cups of green tea on a daily basis for its potential anti-cancer benefits, I also enjoy great coffee several times each week just for the soul-satisfying aroma and taste. Life is too short to drink coffee that is not life-affirming in all possible aspects. Is cancer "in your genes"? Are you convinced there is nothing you can do to change how the cancer-forming genes will behave that you may have inherited or developed? A study published today in the Proceedings of the National Academy of Sciences shows otherwise. A very small group of 30 men with low-risk prostate cancer chose to forgo surgery, chemotherapy, or radiation therapy for various reasons. These men instead chose intensive diet and nutrition changes plus participated in daily moderate exercise and stress reduction therapies as part of a research study led by Dr. Dean Ornish, a physician-researcher who has long studied the effects of diet and lifestyle changes on health promotion. After 3 months of the diet and lifestyle intervention, the men had their prostates re-biopsied and re-evaluated for gene expression of more than 500 different genes, many involved directly in various pathways of cancer promotion or inhibition. Gene activity levels were both increased (48) and decreased (453) at a level of statistical significance. However, it is always very difficult to interpret the clinical significance related to the change in the genes' expression on balance. In this case, these changes could potentially lead to an anti-cancer effect, as the activity of cancer-preventing genes increased while a number of cancer-promoting genes, including those involved in both prostate cancer and breast cancer, decreased or even shut down. These men were not evaluated during this short time frame for how these diet and lifestyle changes may affect their overall long-term cancer survival. Larger and longer clinical trials are clearly (and, I would add, urgently) called for to do that important work based on the results from this pilot study. It is very difficult to quantify these results in terms of estimating how much of a beneficial effect these lifestyle changes might bring to any one individual. I certainly understand the limitations of the study thus far. In fact, several years ago, I had an oncologist ask me publicly after one of my speaking presentations if I thought everything I undertook for my own cancer recovery (which is essentially a comprehensive "cancer rehab" lifestyle program very similar to that which Dr. Ornish has been studying with prostate cancer patients) would really be worth it if all that work only brought about a 2% increase in my odds for long-term survival. I still remember that you could hear a pin drop in that huge auditorium during the moment I thought how to best respond to this oncologist in front of ~500 cancer survivors. Here is what I said: "Yes, I would do everything again, even knowing it only increased my odds 2%. Perhaps it increased my odds from 1% to 3%, which doesn't sound like much, but it is an increase that is still above 0%. Perhaps it would increase my odds from 49% to 51%, an increase that would tip me over into the majority instead of the minority, a group where I would clearly prefer to be." I don't know the intent of this man's question or if my answer was what he was looking for. He did not come up to continue the dialog afterward. However, at least 100 people who were sitting in the audience did come up after the Q&A session ended to tell me that they appreciated my response. "Having undergone, endured, and recovered from several episodes of surgery, chemotherapy, and radiation therapy plus having experienced multiple very unpleasant and even frightening side effects from these therapies, some of which have compromised many aspects of my quality of life on a long-term and daily basis, I would like to add some comments about the word "work" as used by the questioner in regards to the efforts involved with my diet and lifestyle changes. I cannot imagine that anyone would choose to "work" through all the unpleasantness of the cancer therapies I have undergone if one could choose to "work" at enjoying and also improving diet, exercise, and stress reduction while significantly reducing risk for both cancer prevention and long-term cancer survivorship while also improving overall health and quality of life." Research regarding the benefits gained from diet and lifestyle change for cancer prevention and cancer survivorship is not complete, but don't wait for that to happen before you take the opportunity to "work" at improving your own diet and lifestyle that can contribute to overall improved health. Genes may influence, but it is very clear that genes do not completely rule the day. You are what you eat (and do) and apparently so are many of your genes! The ancient forest of earth. Today's New York Times has an article about the large increase in the number of people planting a garden this year for growing some of their own fruit and vegetables, some expanding their plantings and some plunging their hands into the dirt for the very first time. Many explanations are given (taste, health, food safety, organic, cost, etc), but most of the article seems to focus on highlighting people who are concerned with the increasing costs of food (staples and perishable foods like fruits and vegetables). I didn't grow up on a farm, but my parents did have a vegetable garden in our city yard, including 4 small sections that my 3 brothers and I were in charge of planting. I don't remember how many years we did that, but I do remember that my grandparents had gardens, both my grandparents in the city of Chicago who had just the teensiest yard possible (we played on the sidewalk and in the street when we visited) but somehow raised quite a few of their own vegetables plus my grandparents in northern Wisconsin who had bought an old abandoned farm and brought part of it back to life with their large backyard garden. Some years (in fact, many years) life got in the way and we were too busy or I was too ill to really manage a large garden. However, we are again (finally) serious and passionate gardeners and continually evaluating how we can get even more land into production for our food needs. We are voluntarily tied to the land and the seasons and understand that traveling during the growing and harvesting season will not be as easy for us from this point forward. We are content with that decision. • I wear a wide-brimmed hat, sunscreen, and long jeans most of the time, but I hope I am getting a good dose of the sunshine vitamin, vitamin D, hopefully enough to last me through those long northern winters, which are especially long and gray in Michigan. • I enjoy meeting new people. This is easy in a community garden (wearing my "Eat More Kale" t-shirt helps to make people laugh and say "hi"! ), and really points to a benefit of front-yard vegetable gardening. • I enjoy meeting people who are interested in growing and eating great food and sharing recipes and ideas, problem-solving, and experiences. • I enjoy teaching and also learning. Tonight my husband and I met two women who had never eaten strawberries fresh from the garden. Seeing the expression on their faces after sharing some of our freshly picked organic strawberries was just lovely. :-) In addition, my husband had a great discussion with another gardener at our community garden about the merits of various brands of rototillers. • Gardening time is both exercise time and mediation time for me. I am very very content in our garden, both alone and with my husband, and consider this time an essential component of optimizing my "cancer survivorship" efforts. • I'll bet that as soon as I push the button that say "publish" this post, I'll think of at least 5 more reasons why I love gardening. Several years ago, I found these thoughts about gardening and life, which I shared in one of my Email newsletters. I thought it was time to dig it out an share it again. I certainly want my food grown with this amount of care. Thus, I'll end with it as a blessing. Have you started a fruit or vegetable garden this year, large or small, on your patio or in some window boxes? Is it your first time to do so? Why did you start? What have been your surprises and pleasures? I would just love to hear about them! Here is a view of the small strawberry patch in our garden, which is one of the perennial plots in a community garden sponsored by Project Grow in Ann Arbor. It is our 4th year with Project Grow and the 3rd year with this perennial plot. which was taken over from another gardener for whom life got in the way (I understand that! ), so we have been bringing a rather neglected small plot of land back to life. The first year was focused on clearing one area and building raised beds just to get our tomato plants in the ground. I am not sure if we even found the strawberry patch that was completely overgrown early during that first year. 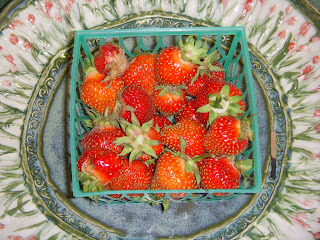 By the second year, we had found the strawberries, got them weeded, protected from the birds, had blossoms everywhere, were very excited about having our very own organic strawberries, and sigh......., we got caught with a late frost. Oh heart-break.......not one, not one! strawberry. We seriously considered plowing them under in frustration but gave them one more year. This year, we supported them with straw, weeded, watered, covered them when there was a chance of frost (this is an effort since it is ~5 mile drive to our garden), put up a higher fence around the garden to keep the deer out (i.e., steer them to those gardens with lower fences), saw the zillions of blossoms again, and have been thrilled to finally harvest our own completely organically grown strawberries. There are so many berries waiting to ripen that I cannot begin to count them all (like a little mini-version of the stars in the sky at night). We have high hopes this year of having our own little bumper crop. In fact, we harvested twice yesterday, once in the morning (these in the picture below) and then even more were ripe in the evening. We'll be making the drive at least daily to hopefully be ahead of any critters who might also be waiting for perfect berries for their dessert. I have been on a search for organically grown strawberries ever since the Environmental Working Group came out with their list of the 12 most pesticide-laden fruits and vegetables in the 90's. I have tried to reduce if not eliminate potential cancer-causing molecules from my food as much as possible. In fact, I was attending a wedding last month where strawberries were served as snacks between the wedding and reception. As I was standing in line, a woman picked up the largest strawberry I have ever seen (nearly the size of the palm of my hand), turned to me and asked if this could possibly be a natural size for a strawberry. Well, there are none in my little strawberry patch that size, so I don't really know, but somehow I doubt it. I didn't eat any at the wedding, knowing I could wait until my own were ready. I'll end with a blessing that could be either a Thanksgiving or springtime blessing. Today I think of it as a springtime blessing (praising those red, ripe strawberries) while looking forward to a good overall harvest and the Thanksgiving to come. I'm attending a dinner tonight that has the theme Slow Fast Food or is it Fast Slow Food? :-) :-) I know someone is bringing burgers made from a locally grown beef. However, for the vegetarians in the crowd, I decided to bring an option that is a whole lot tastier than the veggie burger I was served the last time I ate at Burger King several years ago. My first rule in the kitchen is to always make a recipe large enough to have left overs to eat for lunch during the week or to freeze for another supper or two on days when we need "fast food" at home. Thus, I doubled this recipe, which would make 11-12 nice size patties. As I already mentioned, extras can be frozen so you have really healthy fast food at home. Another rule, I love to simply use what I have in the garden, house, pantry, refrig, or freezer without needing to go to the grocery store. Chances are you have everything in the house to make this recipe. OK, maybe you don't have dried lentils (this time), but that is a quick thing to pick up as you pass a grocery store on your way to the library, bank, etc, etc. Pick up two bags while you're at it, so you are ready next time. Cost for this recipe is pennies on the dollar (maybe nickels or dimes) compared to prepared veggie burgers bought in the grocery store. In addition, you can control the amount of seasonings and salt (most commercial veggie burgers are unnecessarily high in sodium content). It is not a recipe you can make in 5 minutes, but once made and frozen, it will go into the "fast food" section of your brain when you start hearing the "What's for dinner?" requests at your house. A web site reader from Seattle sent this recipe to me in 2006, saying it was one of her favorites. It will one of yours, too. Combine lentils and bay leaf in 2-3 quart pan. Add water to cover by 3 inches. Boil until lentils are very tender, about 1 hour. Drain water from lentils and discard bay leaf. Transfer lentils to a large bowl and cool. Then add seasonings. Stir with lentils until well blended. Cover lentils and refrigerate overnight. Bake potato(s) in oven or microwave. Cool, peel, and coarsely mash. Add mashed potato to lentil mixture the next day and mix well. Using a spoon or both hands, form mixture into 6 balls. Flatten each ball into a 1/2" pattie. 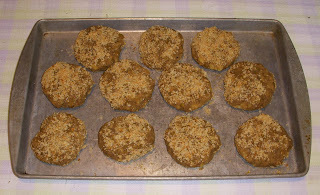 Press breadcrumbs lightly onto patties. Cover and refrigerate 30 minutes to 6 hours. Can be heated in non-stick pan with small amount of olive oil or baked in oven until hot (350 for 20-30 minutes). Flip over at the half-way point. Serve on a whole grain bun with some salsa, fresh leaf lettuce, or even some guacamole. Yum, yum! Only the garlic and cilantro came from our garden for this recipe, but my husband makes our bread, so the bread crumbs were definitely home-made if not home-grown. What else was served, you ask? Homemade milk shakes with locally produced milk and ice cream, salad with homegrown greens and radishes, home made french fries (again pennies on the dollar when starting with whole potatoes instead of buying frozen french fries), and dessert was home made rhubarb pie w/meringue topping and little strawberry tarts, using locally grown rhubarb, eggs, butter, and strawberries. Oh, yum, yum, yum, YUM! Many studies have shown a reduced risk of cancer and heart disease in those people who eat beans and legumes regularly. In fact the Nurse's Health Study showed that those women who ate beans or lentils two times per week compared to those who ate them less than once per month had a 24% reduced risk of developing breast cancer. The reason for this risk reduction is unclear at this point. In fact many reasons may be involved and working together synergistically, such as the fiber, folate, protein and amino acids, flavenol content, or even something not yet identified and studied. I actually gave a goal of eating some amount of beans or legumes on a daily basis (yes, daily!) to enhance my overall health and hopes for long-term cancer survivorship. I call this "Active Hope". This recipe will give you a easy and tasty way to do that, too. I encourage blossoms to flouish with ripening fruits. Ann Arbor, MI finally can join Madison, WI and many other forward-looking cities that will now permit their citizens to keep back-yard chickens. Of course, there are restrictions (how many one home may have, no roosters permitted, set-backs from residences and property lines, proof of approval from neighbors), and the new ordinance is for a one-year pilot project with review and tweaking if necessary a year from now. Here is a copy of the message I sent two days ago to my two council reps, the neighbor I met on Sunday who is running for City Council, and our mayor. I have written previously to voice my support for permitting "city chickens" in Ann Arbor. I would like to reiterate that support and urge you to vote in favor of this ordinance. There are many reasons people wish to have their own backyard chickens. I am a strong proponent of increasing opportunities for people to be involved in their own food growing and production for the myriad of reasons that promote both a healthy body and healthy spirit. Backyard chickens provide an opportunity for people to be making the direct connection between what they eat, how it's raised, and their overall health. I have also heard all the "obstacles" raised leading to the "no" votes by several Ann Arbor City Council members, including the two of you. I admit to being a bit perplexed and wonder why other cities have resolved these concerns and Ann Arbor has had difficulty. Madison, WI, a city that many compare to Ann Arbor, has approved an ordinance that permits backyard chickens with the support of the UW-Extension Poultry specialists. I invite you to view their web site at http://www.madcitychickens.com/index.html. As my representatives on City Council, I again urge you to re-examine this issue, your concerns, and the desires of many of your constituents to have their own city chickens. Having lived in both Madison and Ann Arbor, I would like to be able to agree and say "Yes" to people who like to say that Ann Arbor is just like Madison. Thank you for your reconsideration on this issue. Please vote Yes and then get on with the many other issues of concern to Ann Arbor voters. By comparison, the city chicken issue has no controversial aspects that have not already been satisfactorily resolved by many other cities, and this ordinance should be a slam-dunk approval for Ann Arbor. My two reps voted no again on this ordinance, and one has told me that my neighborhood has deed restrictions forbidding chickens in spite of the new ordinance. I don't know the answer to that claim, but even if true, I am very happy for all of those who can now enjoy raising their own chickens and enjoy the incredible taste of truly fresh eggs. I'm also pleased to have had the opportunity to participate in my city government. Hopefully, Ann Arbor chicken supporters will soon have a cool logo like the one Madison has created. You might have noticed that I have included a link to a blog called The Farmer's Marketer on my side bar of recommended web sites. Full disclosure - the writer for this blog, Kim Bayer, is a new friend that I have had the pleasure to get to know this year. Kim's writing enthusiastically conveys her passion for searching out local foods, appreciation for the farmer and the farming that produces this food, and the sense of community that develops from supporting our local growers and producers. 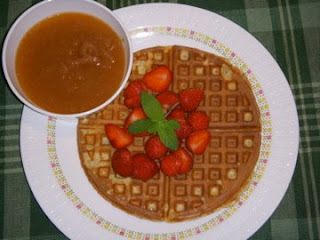 I urge you to read Kim's blog's entry from 5/31/08 Living Food: Tantré Season Begins. I saw Kim at the Farmer's Market yesterday just before she was off to help at the Tantré Farm's CSA tent. She was grinning from ear to ear, looking just like a kid being being told to pick out what she wanted to eat at the candy store, although I think a better analogy would be Kim being told to go pick out as much as she wanted from her favorite Farmers' Market booth! I am a sap, too. First seeing the white canopy set up for Tantre's CSA distribution yesterday and then seeing Richard behind Tantre Farm's booth at the Farmers' Market for the first time this year brought joy to my heart and tears to my eyes. Yes, the circle of life has come around again for another year. How fortunate we all are to again have the opportunity to experience passively and/or actively the best that life in Ann Arbor and everywhere else has to offer. I also just love knowing my farmers. Thanks for showing us the beautiful photo of your friend Nano. As a cancer survivor, I do feel fortunate to be here for another year, ready to delve in and participate in another growing season. I spent the better part of yesterday digging out the remaining thistles in our community garden plot yesterday, and marveling in a disparaging sort of way at how deep their roots went. 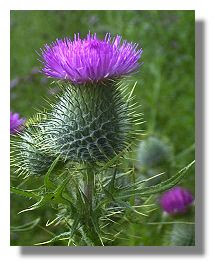 Honestly, I love thistles because they are the symbol for Scotland, the country of my Grant ancestors, and the thistle down is used for nest linings and seeds for baby bird food of one of my favorite birds, the American goldfinch. However, they do not make gardening easy! Thus it caught my attention that, as I was easing my sore muscles from all this very hard work, my husband made a comment that gave me appreciation for these deep-rooted, tenacious, prickly weeds and the value that my work and the thistles themselves would add to our future gardens! He said he just loved having them mixed into our compost pile because they were adding minerals and other parts of the soil from deep below the typical root structures of the vegetables we plant. Thus our thistle-enriched compost was potentially replacing many aspects of the soil that were depleted by last year's growth. As a cancer survivor who has tried to "give it her all" both during treatments and recovery, I appreciated the comparison between the work involved and the short and long term benefits from digging deep to remove those thistles with the work I have done to identify and remove obstacles from my life to enhance my odds for both long-term cancer survivorship and the highest quality of life possible for me. I do believe that the most challenging digging I have done as part of my cancer recovery effort has been to give my body more and better nutrients by changing what I ate, first by changing where I shopped (I still remember my first trip to Whole Foods Market back in 1995) plus going back to cooking much more of my own food from scratch and no longer relying on the large food companies with their increasing number of nutrient-poor processed foods to have my best interests at heart. From there, we joined a CSA (community supported agriculture) many years ago to get even closer to what Kim calls "living food", and now my husband and I have gone back to growing and preserving as much of our food as possible with hopes to do even more than we currently are able to do in our community garden. In addition to growing and preserving our own food, it has been important to my husband and me to remember to take the minute or two before eating to offer a blessing and some words of thanks for our food and all those people dedicated to growing living food in order to nourish us. It's hard to know who to thank for all of the processed food items people eat these days, mistaking them for food. However, I find it both easy and pleasurable to envision the farmers who grow the delicious foods we purchase at our Farmers' Market when giving thanks and saying our blessing. Today is National Cancer Survivor's Day (always the 1st Sunday in June). My hat is off to all of the 11 million cancer survivors in the US (24+ million world-wide). I send my best wishes to all of you for years (even decades!) of good health, healing, and hope. For those of you reading my thoughts who are cancer survivors, what are you digging deep to find to help nurture the best odds for extending your life and optimizing the quality of your life for another year? Please feel free to share your thoughts!